The reluctant beginning of the end is here, Shadowhunters fans. As much as we don't want to say goodbye, it's great to finally see our favorites on the screen again! Like the characters on Shadowhunters Season 3 Episode 11, we picked up right where we left off: Clary's death. And just like the news of Shadowhunters' cancellation, the reality is heartbreaking and filled with plenty of emotions. The group isn't ready to say goodbye to Clary, and neither are we. Luckily, Clary isn't giving up yet, especially in this thrilling season premiere. "Lost Souls" highlighted why Shadowhunters is a captivatingly intense and amazing show: the quality keeps getting better and better with each new half-season. Just think about where we all started during Shadowhunters Season 1. The journey from Clary's first encounter outside the club to her now running through the snowy banks of Siberia is almost night-and-day. Not just with the plot content, but with the editing, visual effects, and the dialogue. The series grew alongside its characters to be a more polished and mature show. Several times throughout the hour, I marveled at the attention to detail placed on the special effects and camera angles. The magical effects received an upgrade and looked more visually seamless than before. Maybe it had to do with the budget or time for the Shadowhunters Season 3B premiere? But whatever the reason may be, Shadowhunters should keep the momentum going from this point on. In particular, everything about Clary and Jonathan's scenes was spectacular. From the complex brother/sister dynamic to the movie-like quality of Clary's escape. The show hit it out of the park. Shadowhunters raised its tension when Clary ventured out into the snowy fields of Siberia. Dramatic heart-pounding music, sky-high camera angles, and Katherine McNamara's great wordless acting highlighted the terror Clary felt in that moment. You could feel her panic as she raced for help with no one around, and ultimately, the hopelessness of seeing the empty field toward the mountains. Plus, great job to the editors for adding in the snowy tracks of Clary's roll down the hill! It's the small details that truly warm the heart. I'm not surprised that Clary survived the explosion in Lilith's apartment on Shadowhunters Season 3 Episode 10. The disappearance had "red herring" all over it. Plus, Clary had a lot more story left to tell before things blew up. We needed to experience this long-awaited reunion with her evil brother Jonathan in his true face. Regardless of what he (and his chiseled jaw) says, Jonathan cannot be fully trusted. Let's not forget that it wasn't too long ago that he tried to kill Jace and Clary. And that decision wasn't completely rooted in control from Valentine. He did that himself. Don't get me wrong, everyone deserves a chance for redemption. If he wants to be good and explore his inner light like Clary, all the power to him. But, we can't keep lower our guard yet. Jonathan still has evil in him, and he wasn't taking Clary back to her loved ones in New York. That sketchiness can't be ignored. Clary: Jonathan, if you’re looking for pity, you’re wasting your breath. Jonathan: I’m not looking for pity, just understanding. I can’t deny the things I’ve done, but it’s behind me now. I can change. I want to change because whatever good exists inside of you, at least some of that has to be inside of me too. Somewhere. I intend to prove that to you. Permalink: Whatever good exists inside of you, at least some of that has to be inside of me too. 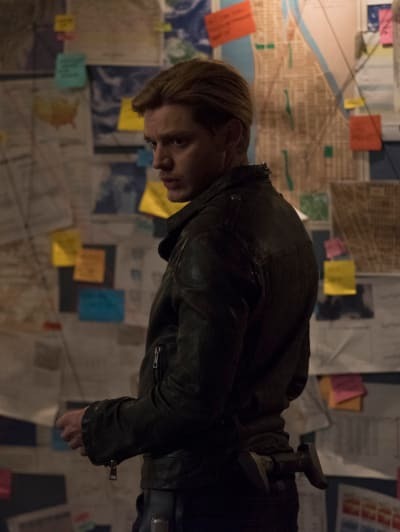 Clary's new magical connection to Jonathan will no doubt put her life at risk. Lilith may be the Queen of Edom, but she's apparently the Queen of Clever and Pettiness too. She knew exactly how to keep her son alive after the resurrection ritual turned out to be a success. No one would risk killing Clary just to get rid of Jonathan. What makes the twist even more clever were the teases and tidbits in Jonathan's dialogue. He kept relating how he and Clary were the same, and how a bit of her light could be inside of him. Clary is lucky that Jonathan had the strength to activate his healing rune. Good on her for protecting herself, but she can't make that same mistake twice. She has to find a way to work with him; though, she can't forget the power she holds too. He needs her just as much as she needs him. 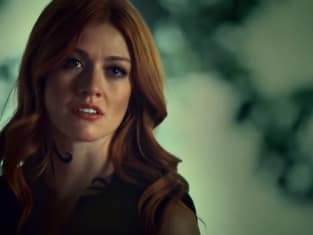 Shadowhunters Season 3 Episode 11 showcased a good representation of the characters reacting to Clary's death. 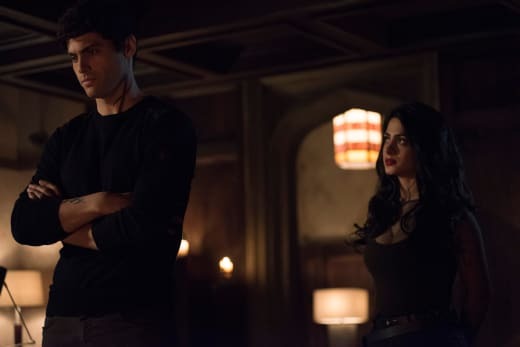 Sometimes people stay strong and hold in their emotions (Izzy, Magnus, and Alec) or they let it out and react (Jace and Simon). Thankfully, their grief didn't come across as forced or minimized. In their eyes, Clary died and they needed time to grieve. Shadowhunters didn't let them pick up their weapons and move on; they're dealing with those emotions. And that good decision made them feel more human. Jace, in particular, should heed Alec's advice and take time to clear his head. He shouldn't blame himself for Clary's death. Lilith had control over him as the Owl demon and he couldn't do anything in that state. Eventually, he'll be reunited with her, but until then, he should work on himself to overcome the baggage built over the years. Luke should also take a break too. And a shower. And time outside of the motel room for some sun. Even though he's onto the truth of the teleportation, he's more so using this to avoid the grief. Luke didn't allow himself time to deal with Clary's death. By diving into this conspiracy theory, he's pushing himself into a rabbit hole of hope. We as fans know that Clary is alive, and eventually, they'll have a sweet reunion as daughter and father-figure. However, you can hear it in Luke's voice; he needs to take a break and recharge before he cracks under the pressure. On the other hand, what made him look into this clue specifically? We need exposition! Rafael: I was never able to find him myself, but there’s a legend of a vampire who lives in hiding in the sewers of New York. They say he’s the oldest vampire in the city. Maybe even in the world? No one I’ve met has been able to see his face. If there’s someone who knows of these kinds of things, it would be him. Simon: How do you know if this guy actually exists? Rafael: Aren’t all the legends true? Permalink: Aren’t all the legends true? The same thing goes for Simon as well. He can't blame himself for what his Daylighter mark caused in the penthouse. The explosion killed Lilith, but no one would've known the extent of its power. The mark does more good for him than bad. We can't forget that he gets to walk out in the sun, and enemies are prevented from killing him. Clary merely got caught in the crossfire of a battle with a Big Bad. Diving underneath New York City to find the oldest vampire is merely a distraction. He might find what he's looking for and he might actually get his mark removed, but Simon is better off keeping it. This is a fool's errand and one that will hurt the feelings of the Seelie Queen when she finds out. I'm on the fence whether Iris is a good villain or a very ineffectual one. Why didn't she just grab Madzie when she teleported into her room? Why did she so easily buy Catarina's lie to hand over Madzie? Did she not question how easy it was getting Madzie back? Why didn't Iris set up more precautions for the trade? Iris during "Lost Souls" seemed like a shadow of her former self. We're talking about a powerful warlock who caused strange pregnancies to increase the magical population. And, she's a talented fighter who knows how to use her magic in battles. Here, she got bested by emotions and a cheap lie. It's almost as if the writing rushed to find a way to get her captured again. Magnus: [Recoils from touching eye] Ah! I don’t know how people do this every day?! It’s taken me an eternity to make myself half-way presentable. 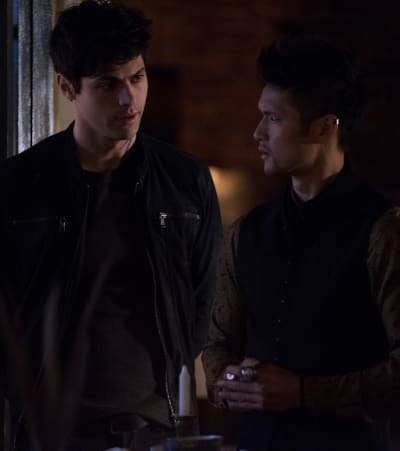 Alec: I don’t know why you think you need it. You’re beautiful the way you are. Magnus: Thank you, but it’s not about beauty. A tiger has stripes. I have eyeliner. Permalink: A tiger has stripes. I have eyeliner. Still, the benefit of this side-storyline came in the many scenes for the "Malec" shippers out there. Magnus and Alec playing house AND cute quips made to each other; we were spoiled this time around. I can't wait for when Alec starts training Magnus to fight without his magic. This training will bring them closer together as a couple and it will strengthen their independence. Though, Magnus has yet to face the long-term hardships of being without his powers. You could feel his loss of self during the early ritual, the meeting at the Institute, and the battle with Iris. He's spent so long with his magic that this is a whole new world for him. How long do you think it will take before he tries to get it back? Rafael is really turning things around and trying to make amends. His character development took a pleasant turn from the stoic vampire we met way back when. Maia and Simon have a long way to go before their friendship gets back to normal. They made peace, but the tension was so awkward between them. 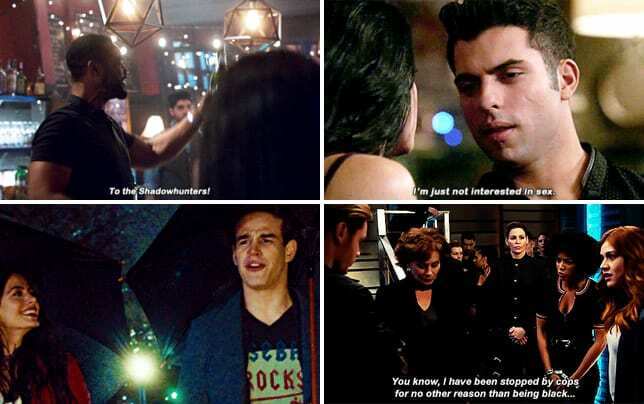 Izzy's low-key shade to Maia about not being there for Simon = savage! Isabelle: The stalker vampire Heidi ... she made Simon feed on Becky in front of their mom. Isabelle: Luckily, Becky is okay, but his mom couldn’t handle it. He had to encanto her to make her believe that he was dead. Simon had to say goodbye to his mom forever. Maia: I had no idea. Isabelle: How could you? You weren’t here. Maia: Me leaving had nothing to do with Simon. I just needed to be alone. Have you ever felt like that? You just needed to get away from it all? Isabelle: I have. I guess when times get tough; some people need to be alone. And others need to be around other people. I’m more like that, and I think Simon is too. Permalink: How could you? You weren’t here. 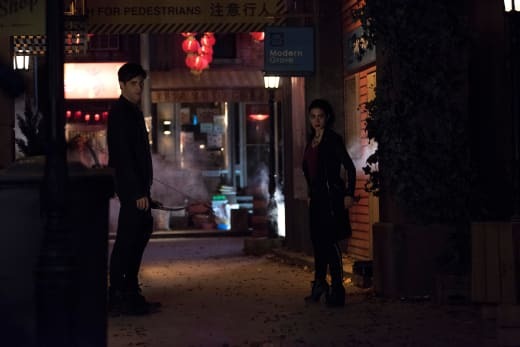 Shadowhunters definitely teased Simon and Izzy's eventual romance as "Sizzy." She dropped hints that they're more alike in their personalities. I can't wait! Consul Penhallow is totally involved in whatever experiments are happening at the Gard. Her response seemed more dismissive than being naturally cold. Could it be mind control? 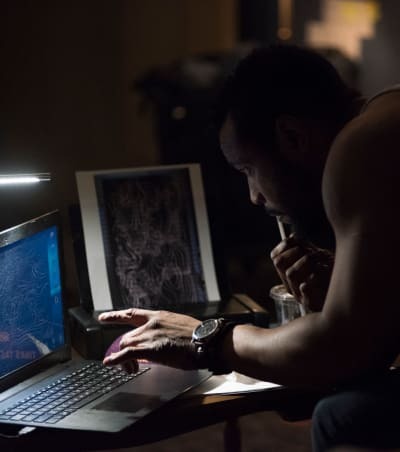 Are they creating their own Downworlder army? Are you going to miss Ollie too? I grew to like Luke's partner and her optimistic ways. Now, over to you, Shadowhunters fans! What did you think of "Lost Souls"? 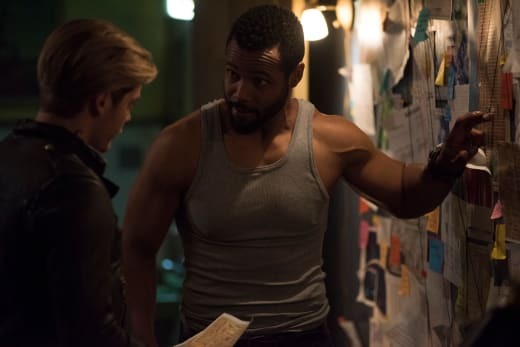 Will Clary find a way to free herself from Jonathan's connection? What could the strange experiment on the Seelie mean? Is this the last we'll see of Iris? 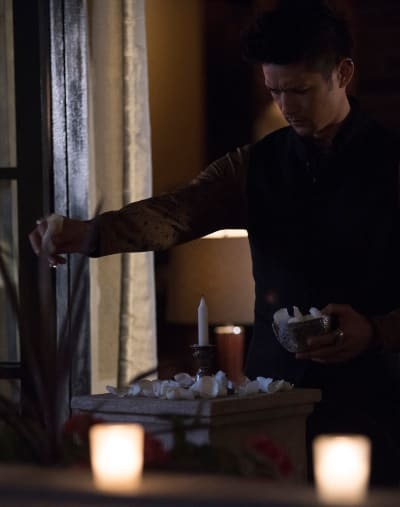 If you missed the latest episode of Shadowhunters, you can watch Shadowhunters online via TV Fanatic. Come back here and share your thoughts in the comments.